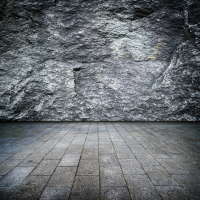 The idea of using sealers on stone surface is to prevent water from penetrating the porous structure of the stone, which eventually leads to stains, cracks, weathering, and deterioration. There are largely two types of chemical agents for stone cleaning. Some chemical agents can fulfill both purposes, but mainly, these two types are used in the most appropriate situations. What makes deterioration of stone? Regardless of how polished it is, the structure of natural stone surface is porous with many invisible tiny holes. Therefore, penetration of water or moist is the main reason for deterioration. The one reason to conduct stone sealing is this. The phenomena of efflorescence and weathering also stem from water. Therefore, it can be said that for protecting stone, it is most important to protect the stone surface from water. Sealants have been developed for this purpose and stone sealing become popular method to protect the stone surface. 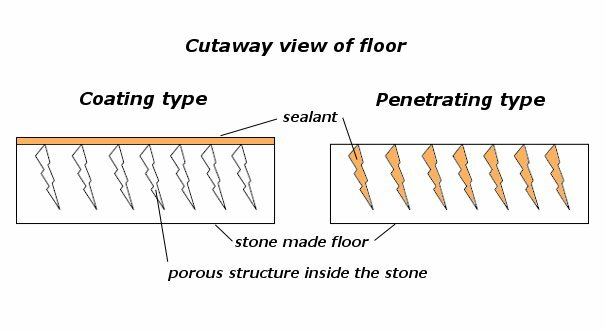 For stone sealing liquid, the following two methods are used: (1) "coating," which makes a transparent layer on the stone surface, and (2) "penetrating," which passes through the stone porous structure. By using penetrating type of stone sealing liquid, the absorption rate of water will dramatically decrease. We offer various types of stone sealers with different characteristics such as water repellent, oil repellent, anti-weatherability, acid resistivity, and so on. What is more important about stone sealer is the color. If you use these types of stone sealants and the color of the stone changes drastically, the design will be spoiled. Sealers have to be transparent and should not affect the color. Majority of the removers are used for removing rust and stains. Additionally, there are products that can be applied to efflorescence, water scale, decoloration, oil, silicone, and coking. Although it is important to prevent stains, depending on the situation, this cannot be avoided. In such cases, stain removers help remove all types of unwanted taint and contamination. These stain or rust removers are powerful but have to be selected according to the type of taint you wish to remove. Some look similar but have different compositions depending on the products. This products is effective for sealing purpose on natural stone such as granite. It can be also used for limestone, marble, sandstone and others. However these kinds of stones tend absorb more liquid compared to other stones. Ariston penetrate into the stone material deeply and form a protective layer. Will be excellent sealer for stones, concrete and tiles. This products is effective for sealant purpose with natural finish on natural stone such as limestone, marble, sandstone which has porous. This product can be applied to Granite, Vitrified tile as well. This product is effective for removing vegetable oil and grease from the stone surface. 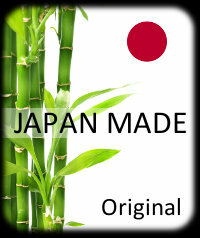 Can be applied on cooking area at restaurante, kitchen top or food material factory which use oil frequently. Also, this product suit for removing engine oil as well. This product is very effective liquid for removing silicone sags on stone without damaging the surface. Also, this product can be applied to oil removal especially for automobile oil. This coating agent has strength in forming a protective layer to building stones such as granite, marble, imitation stones, and tiles. The liquid will not penetrate to the stones and form excellent layer to prevent absorption of water, stains and dirt. This transparent layer will not change the color of the stones and maintain its beauty for a long time. Acron AB is very effective as detergent purpose on Granite especially polished surface. Also well suit for marble and other stones. It contains 35% of hydrogen proxide. This liquid consists of two ingredients. Vector is very effective for removal of rust, sallowness, yellowing and dirt of marble and polished granite. Especially it is good for rust invasion from outside to surface. Also it is effective for rust removal from inside such as an interior iron frame, fixed clasp. 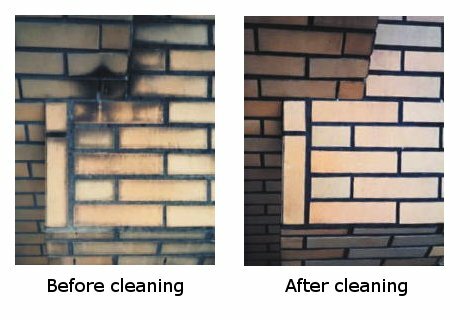 Efflon is very effective for removal of rust, water scale and efflorescence of tile, granite and etc. Calcium inside of concrete or mortar desolve with water, will emerge on stone surface. Then what we call, efflorescence (white stain) will be created by reaction of carbon dioxide in the air. This is very effective for removing of rust, water scale, and stain of tile, granite, and general exterior material. This detergent suit to materials which have porous structure such as tiles and ceramics. Since this product consist of acid base materials, has powerful effect on removing water scale and rust. But on the other hand, this product is not suitable for polished stone surface because it may etch the surface by its acid.